Bicycle Arpeggio is a kinetic musical sculpture created from re-purposed bicycle components. The mechanism’s design mimics that of a cylindrical roll common in early musical automatons such as barrel organs and music boxes. Steel bicycle frame tubing, tuned by length, are placed around the rotating cylinder and act as both the programmable score and the source of sound. The resulting sound is primarily driven by chance operations generated from the interactions of the multiple rotating cylinders, which sound both individually and together, depending on when the riders choose to actuate the striker mechanism. The composite effect is a series of rapid melodic lines which create phase patterns and permutations of the preset phrases. 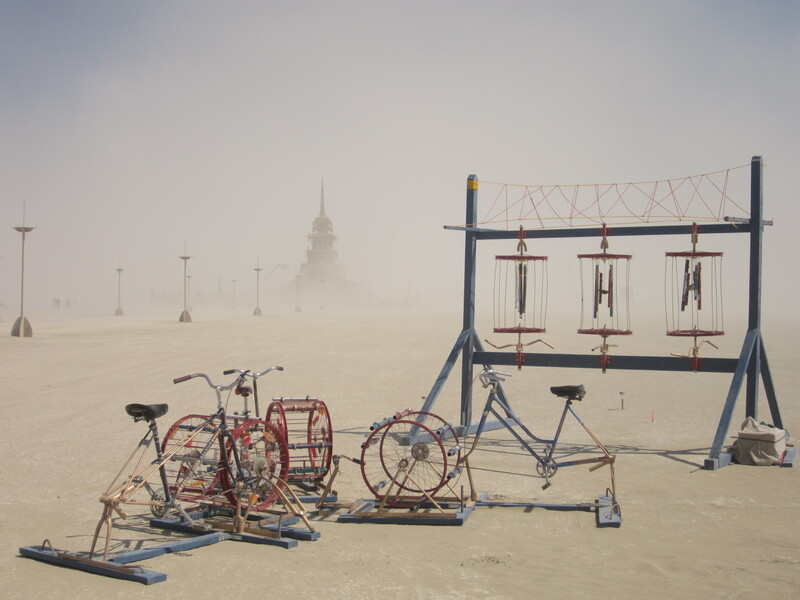 Bicycle Arpeggio was featured at Public Dreams’ Illuminaries Festival in Vancouver and exhibited at Burning Man 2012.